After few attempts to purchase The Unforgettable stamp set and dies from Wplus9, I was able to get it from Butterfly Reflections Ink . Did I tell you that international shipping at Butterfly Reflections Ink is very reasonable and fast as well 😉 I looked at the set like a little child receiving surprise present. LOVE the elephants in the stamp set. Normally I am not a big fan of cute looking animal stamps but I have soft side for elephants. I have grown up seeing them almost everyday. I adore them. So I have to have this set. 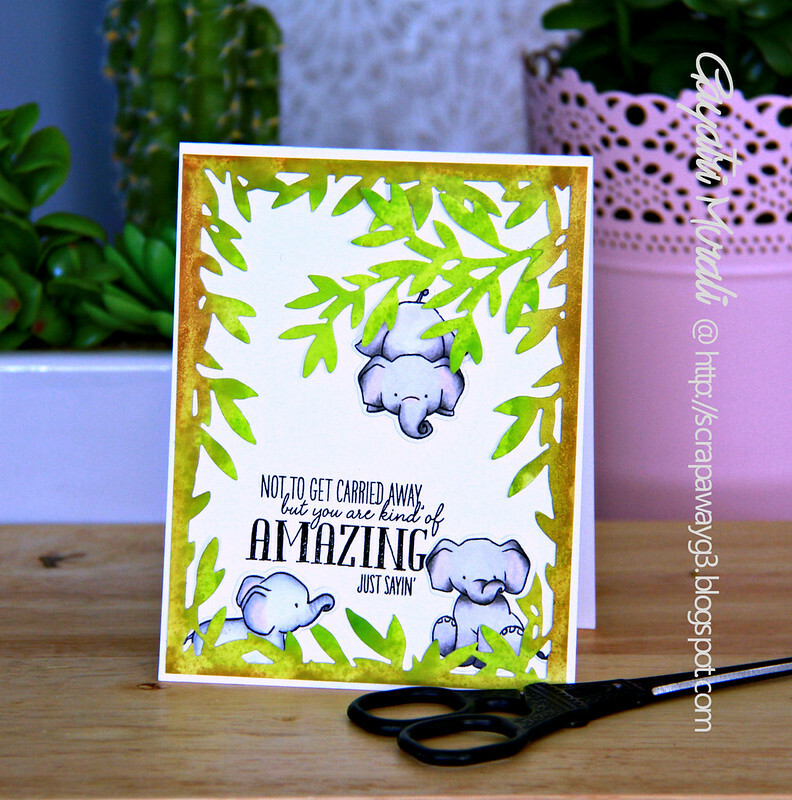 Anyway, I stamped, coloured, die cut the super cute elephants yesterday and today I made cards. I am sharing one today. This card is inspired by Elle, the she elephant from Ice Age II movie. Remember Elle used to hang from the trees like her possum brothers? So when I first saw the hanging elephant in the set. I wanted to make a card inspired by Elle. Luckily, Wplus9 has this beautiful Foliage Frame Dies which I have used on green and brown watercoloured paper to die cut the frame and branch. I adhered this frame and branch to the card front. Then adhered the elephant as if he/she is hanging from the branch. I stamped the sentiment towards the left bottom. I felt adding couple of more elephants will balance the card. And it did. I love it so much that I am not adding any embellishments. Adorable with a technique clean and simple card. omg what a cute scene!!!! love this! Another fun way to use these elephants..what a great idea! So cute! I caved and bought this set the other day. Can't wait to play! Excellent plan played out here! Unlike any other card I've seen using these stamps! NICELY DONE!! 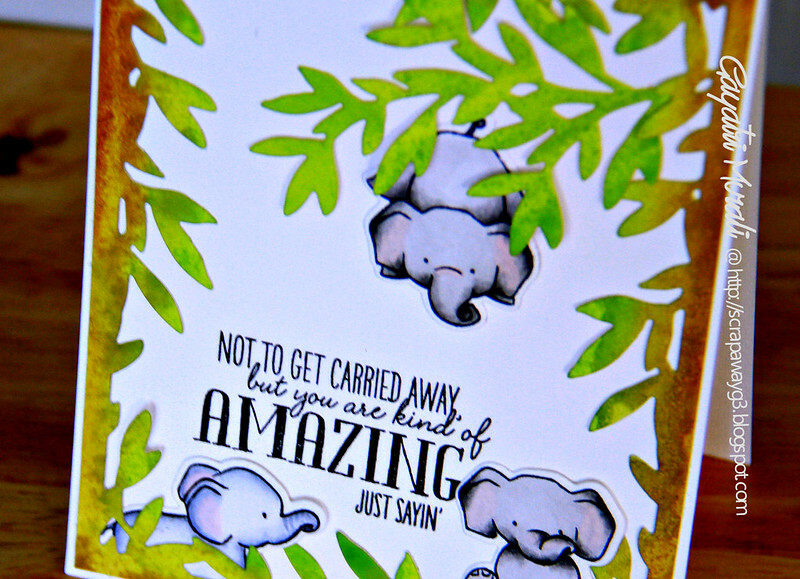 Oh lucky you, all of the new elephant sets are sooo sweet, I just love how you coloured them and created this sweet scene. You are truly an inspiration and I can't wait to see a few more elephants visiting your blog lol. Adore those elephants playing in the leaves/tropical jungle!! 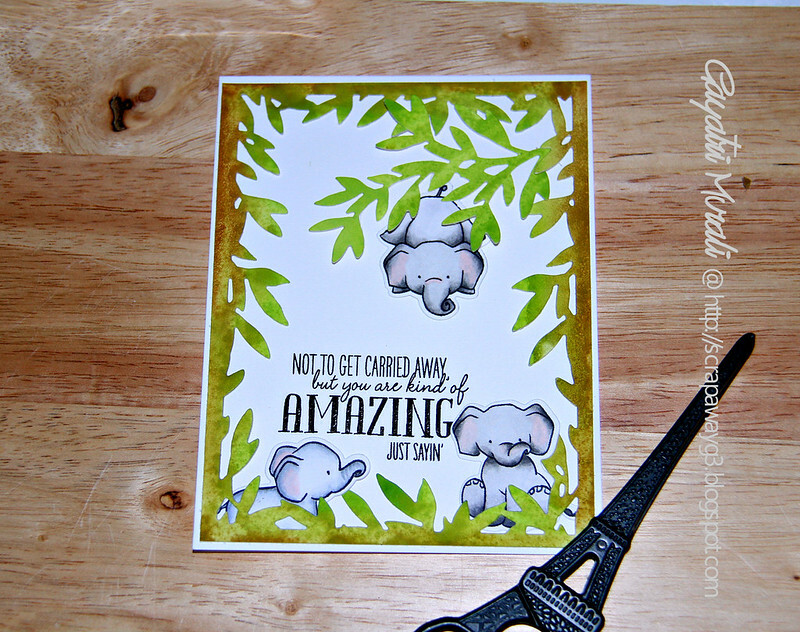 Love elephants too and this set is adorable as is your card.